Esme seems much better. She wasn't the only kid that was out of school all last week. And now I've heard a nearby town has also shut its school down for part of this week to keep the flu from spreading more. I finished a really good Vikings-in-the-future book called Dangerous Talents, and another called 'Suitable Bride' (historical) that was more on the same line with the other two heiress books that were in the historical fiction email I get. Now I'm reading one called 'The Accidental Demon Slayer', which is hilarious. Good to report I think I've missed the vitamins only one day since I started taking them. I'm not sure if they are doing any good.. maybe. I've also taken to trying to stretch out some muscles at night in a routine, but not every night. We'll see if that becomes a morning thing this week as I have all mids and closes. We so wanted it to be warm! And now there is this cold snap. Hope for it to warm up this week again. My brother is visiting my sister in Oklahoma for a bit, which is wonderful for him to get out of the cold of Minnesota and see some family as he was feeling quite badly about a month ago. This is Liz, Esme's new teddy bear hamster. She came from the Fish Tank store in Paris, TN - and she is very tame. Unlike other things in our household. No wonder the pies keep disappearing! waiting for a treat in the kitchen. Esme is still sick. She threw up again tonight but mostly from coughing after eating. We've kept her home all week and will keep her home tomorrow, too. Maybe Monday. I planted a daffodil in the garden today, too - a white daffodil with pink middles. I was very surprised to find them for sale, so I had to get one! I put it in the garden next to the hyacinths. Esme was still sick today - she had hit 103 during the night before we gave her the Tylenol. The fever has not went that high again, hovering just at 100 ever since the Tylenol wore off. I got her to drink every few hours and this morning I told her to eat some soup and a bit of sandwich before she could play her dragon game and check in on her hatching egg. She was avoiding food mostly I think because she says her coughing makes her feel nauseous. Still watching this. I have today off but have to get back to work tomorrow. The hamster seems to have adjusted some - she found all the things in her cage and ran on her wheel half the night. Esme has named her 'Liz'. runner up would have been 'Nipsy' or 'Queen Victoria' (Mark's suggestion). I finished 'The Girl Before'.. a little unexpected, a little disturbing in places. I can see the four out of five because the twists were different enough to make an impression. I have 'The Lavendar Garden' and another short little book about a robbed heiress that came on the coattails of the other one in the free book email. 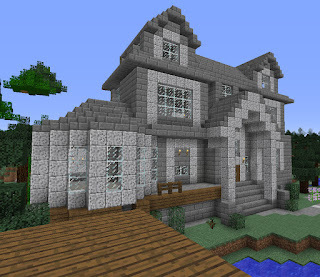 So we found the jungle in Minecraft, and I built a suburban house there. Heh. Esme seems to have gotten partially over having the flu, still says she feels a bit weak and dizzy but mostly because she is still trying to avoid meals... made her eat some soup today before a bath and she feels better again. We are planning to go to town to look at the pet shop and get our groceries. Mark put my three Great Big Sea albums on a portable mp3 player for me and I'm enjoying it. I have another CD coming in the mail sometime next week of things I have liked. Also my Sweetie dog has hurt her ankle again... poor thing. Her and Daphne both have that trouble of spraining a foot now and then and limping for several days. Finished 'The Unwanted Heiress' and 'Twelve Doors of Faery' in the past few days, both nice short quirky books. Into something more popular.. 'The Girl Before' Usually I tank those sort of things halfway through... we'll see. We got Esme a teddy bear hamster today at the pet shop. She was excited. We used the old rat cage and wheel for her. Esme was tuckered out from her sickness when she got home - too much for her going to the store and all. She is asleep on our bed now after getting the cage set back up with Mark. The hamster is a little black and white female, quite sweet and inquisitive. Really pretty dahlia bulbs Mark got me for Valentine's Day. They are a pretty bouquet that we can plant in a pot in the garden when it warms up. and a bunch of radishes and radish seeds, as I told him I was thinking of planting some soon. Esme got a cute little pink lion I found at the store last week and hid from her in my secret hiding place. I didn't forget Mark - stashed him a special chocolate bar somewhere he didn't think to look. Other than that I have to work later tonight and then I get two days off. Esme had a great weekend with friends, although they watched a horror movie, so we've dealt with a nightmare or two. I've had to work the weekend - feel like I haven't gotten anything done at home but at least I'm doing a lot at work. Work just seems like a neverending game of 'Let;s Find Something to Do Right Now: menial task edition'.....getting it done, but I don't like that mindset of making a three million item checklist just to stay busy. It presses my stress button. I guess if it was someone else's three million item checklist that didn't make any sense to reality it would be worse. So, there's that. When I put something on the 'checklist' in my head, it makes sense and needs to be done. This week I'm going to press harder about those signs, one of which hit me in the nose last week and caused a bloody nose and a bad bruise. Temperature changes have brought on a lot of weird dreams. Mark is still getting over his flu / sinus and running a low grade fever - the cold and hot weather swings aren't helping him much, either..and hosting the girls this Saturday drained him a bit but getting to sleep undisturbed on Sunday for a good while when she was over at their house was probably good again. My hyacinths are starting to come up in the garden - went to look for them this Saturday. Had a couple of emails back and forth with Esme's teacher.. seems she had been 'enterprising' with her snacks at school and trying to make a few quarters - a little like her Daddy back in the good old days selling candy at his middle school that he had picked up at the gas station. We've let her know that is not to continue no matter who wants it... a little funny considering but I know it is a little sad too because she really thought she was making friends that way. Being seventeen or so riding my ten speed bike through the town of Grand Rapids, MN from the high school area where I lived up to the Hardees on 'Hamburger Hill' halfway across town. I remembered the two curbs specifically that were not 'let down' to the street and having to hop the bike up each one at speed and sometimes missing..it really jarred my teeth when I missed. I remembered doing this with my uniform in my backpack and changing out to work my shift, then my brother Bill picking me up in his truck at night so I wouldn't ride back in the dark... such a long time ago, twenty years now... I would likely die just to ride one mile now much less three or four uphill. The other memory was walking into Esme's room and finding that her cat Polliwog had given birth to kittens in her bed, just before bedtime.. and having to scramble to clean up the bed and put the kittens somewhere safe while everyone simultaneously groaned and cooed over the kittens... That memory hit me the other day when I opened the door with her clothes hamper in hand and I know our cat Pumpkin is pregnant now again... hoping history does not repeat itself there. I thought I'd take a snap before school. I feel I'm so busy lately and one thing or another I haven't taken very many pictures for her to see when she is older... We have her Valentine's project I need to help her bring in on Friday - so it won't get destroyed on the bus. Working through to the end of the week - I have Friday off. Knit some more on the scarf while we watched movies last night. I also started taking vitamins again yesterday, see how long that lasts... they told me my attendance at work had slipped and I needed to focus on being there every day on time for a year or it would go to the next level. In ten years, I've never been even on the first level. They counted the battery dying in our truck in December and a closed road for traffic (that was closed for an hour and I had to detour around it) last August, too... so I think it was a bit overzealous. Anyway. Finished the Cure of Clan Ross books by L. L. Muir. I liked them - they were sweet and well thought out at the same time. moving on to the third book in Hannah Howell's Murray family series. I've made it through the sinus infection, mostly... and am continuing with the above regimen trying to knock the rest out. I've been adding extra cayenne pepper and curry powder to my teriyaki ramen noodles and that really helps drain my nose. I'm exploring more of the Minecraft world Esme and I have been working on since about the first of the year, and have a book and a knitting project for whenever sitting and playing with the maps and ships becomes too boring or too cold. It promises to be a bit warmer today. This is what Esme's scarf looks like today... doing a simple 3x3 basketweave that sometimes extends to 3x4 when I'm not paying full attention. I tried Tabasco sauce for the first time in my life today. It's like a really spicy green olive. Mark says I'm probably the only person who thinks that. It seems I just had too much going on my plate this morning - only a few hours of sleep, sinus infection and heavy labor (freight came in today) mixed to make me crash about 10:30...was having a bit of a fever, really hard time remembering things I had just done and stare at something about three times to get the information processed to know what to do with it. All in all - I may be the only person who can do those tasks but I wasn't doing it very well compared to usual. I took lunch, got back up after an hour and went to get the necessary stuff done, and then went home from work early.